You can access the NMS Match System by selecting the Log In option in the menubutton in the top-right corner of the screen. To log in to the NMS Match System you will need to enter both the e-mail address and password that you use on the shared PASS/Match registration portal (ADEA PASS/Match Portal). The password you use to access the NMS Match System is the same as the password you use on the PASS/Match portal. ADEA PASS only transfers the first 10 characters of your password to NMS. If you have a long password, enter no more than the first 10 characters into the NMS Match System. If you do not know your password, please access the shared PASS/Match registration portal where you registered for the Match (ADEA PASS/Match Portal). You can request the ADEA PASS system to send you an e-mail with your password. After you log into the NMS Match System you are presented with a Dashboard. The Dashboard shows your current participation Status in the Match, your Couple Status, and Rankings Status. The Status section shows your participation status in the Match. All registered applicants who intend to submit a Rank Order List for Phase I or Phase II of the Match should have a status of Active. If you do not intend to submit a Rank Order List for either Phase of the Match, you must withdraw from the Match. If you withdraw, but later decide to submit a Rank Order List for the Match, you should reinstate yourself to participate in the Match. All registered applicants start with a Couple Status of INDIVIDUAL. If you want to participate in the Match as part of a couple, you must change your Couple Status to COUPLED by identifying your partner. Once submitted you will be asked to confirm that you wish to be partnered with the applicant registered with the Match Code Number that you have entered. If your partner does not identify you as their partner, your rankings will be treated as if you are an individual applicant in the Match. The Rankings section of the Dashboard provides a summary of your Rank Order List information. The summary information shows the number of ranks on your Rank Order List and whether or not your Rank Order List is certified for use in the Match. Your Account information includes your e-mail address and password. Your Account information is provided to NMS by ADEA PASS and it cannot be changed using the NMS Match System. You can update your Account information if necessary by making the appropriate changes in the ADEA PASS/Match Portal. Changes you make in that portal will be reflected in the NMS Match System within 24 hours, not in real-time. Your Profile information includes your name, mailing address, telephone number(s), dental school of graduation, graduation date, and DENTPIN. Your Profile information is provided to NMS by ADEA PASS and it cannot be changed using the NMS Match System. You can update your Profile information if necessary by making the appropriate changes in the ADEA PASS/Match Portal. Changes you make in that portal will be reflected in the NMS Match System within 24 hours, not in real-time. To enter ranks into your Rank Order List for the Match, select the Rankings option from the menu in the NMS Match System, or select Edit in the Rankings section of the Dashboard. 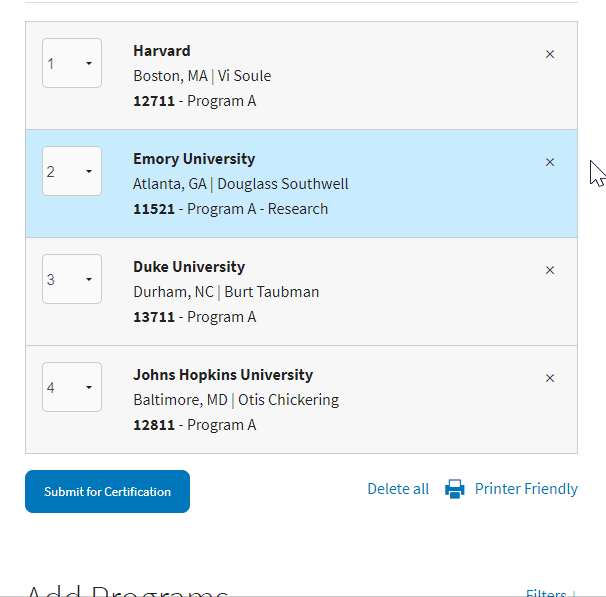 Start typing in the search box to find the program you want to rank. Programs can be searched by Code Number, residency name, Program Director name, program description or city. Use the available Filters to restrict your search results to a specific program type or state. Programs that are withdrawn from the Match will have a Withdrawn flag next to their program name. You should leave the withdrawn program ranked on your list. If it becomes active again before the Rank Order List deadline, that ranking will be used in the Match. If the program remains withdrawn, that ranking will not be used in the Match, and your list will be processed as if you had not ranked the withdrawn program. Select the Program from the list of search results. Press the Add to List button to add the program to your list. 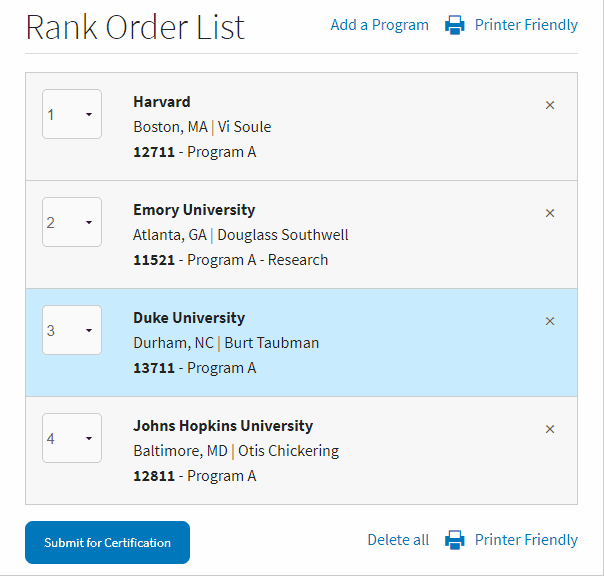 Programs should be entered in rank number sequence, with your most preferred program as rank 1, your next most preferred program as rank 2, and so on. You may add as many programs as you wish to your list. To move or re-order a rank, use the drop-down menu attached to the rank number. 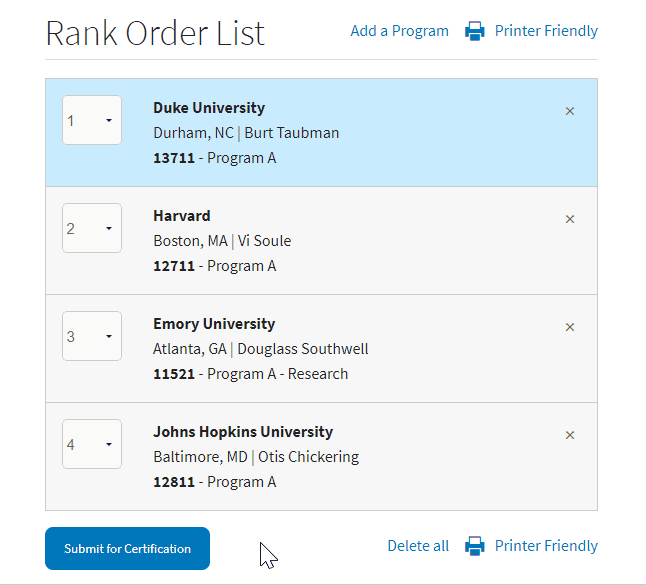 You should select from the drop-down list the rank number to which you want to move the program. You will be able to view the printer-friendly copy of your Rank Order List until 4 days after the Match Results are released for each Phase of the Match. 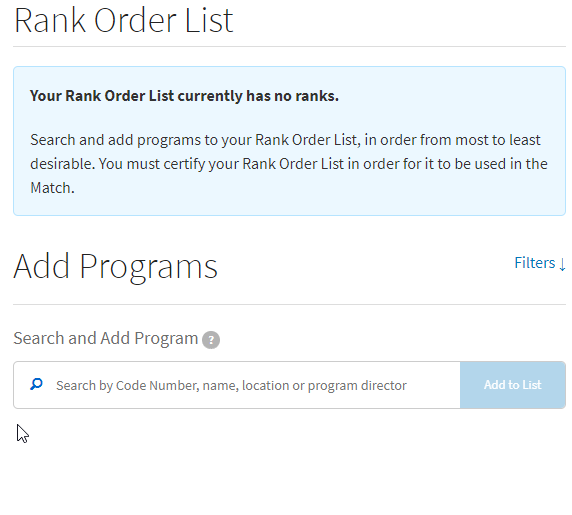 Certifying your Rank Order List tells NMS that your rankings are complete and ready to be used in the Match. You must certify your Rank Order List for it to be used in the Match. You can make changes to your list even after it is certified, until the Rank Order List deadline. If you make changes to a list after it is certified, the list will become uncertified and you will have to re-certify the list for it to be used in the Match. Your Rank Order List must be certified by 11:59 p.m. ET on the Rank Order List deadline for each Phase of the Match in which you intend to participate. You will not be able to certify your Rank Order List in the NMS Match System after the Rank Order List deadline.